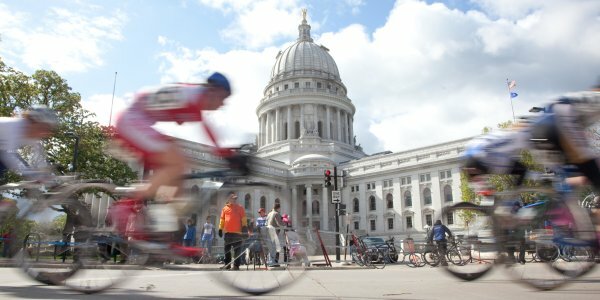 As the bike capital of the Midwest, the Madison Area boasts more bikes than cars! 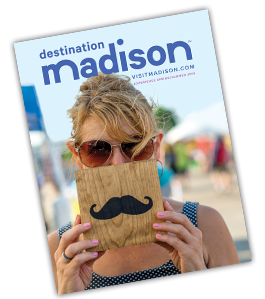 In and around Madison, more than 200 miles of scenic biking and hiking trails are available for all biking and hiking enthusiasts. Traversing the city on bike is both easy and beautiful! Planning an urban route but concerned about heavy or high-speed traffic? 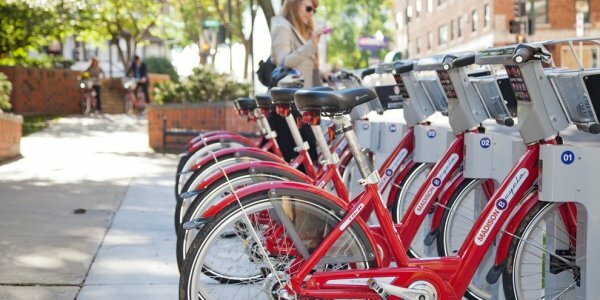 Check out the City of Madison&apos;s Low-Stress Bike Route Finder to map a ride that suits your comfort level. An easy, two hour ride around Lake Monona, going through B. B. Clarke Park and Olbrich Botanical Gardens. Scenic route looping around Lake Wingra through Vilas Park and Nakoma. Running along the shores of Lake Mendota, past the Memorial Union to the Picnic Point area. 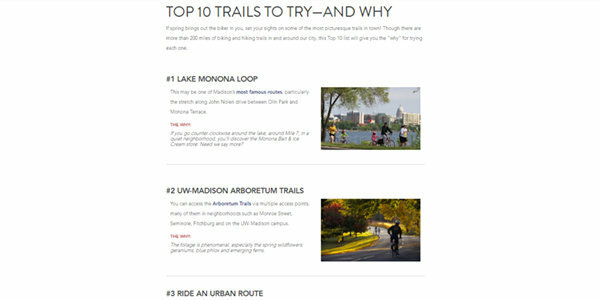 The City of Madison offers numerous resources to help you plan your biking or hiking trip in Madison, including bike maps and more. This area is said to have some of the best mountain bike trails in the country! This trail system offers 5 different loops each varying in length and difficulty. The red loop is a short beginner level loop through open fields, scattered pines, and hardwoods. The blue loop consists of tight singletrack and steep rocky hills designed to test physical strength and riding ability. In contrast to the technical difficulty of Blue Mound this is the place to crank up the RPM&apos;s and carry some speed. Check out the trail maps to see which one is right for you and don&apos;t forget to buy your trail pass before you go! Offers 12 miles of trail for enthusiasts willing to take the challenge. The DNR ranked this the best mountain biking trail in Wisconsin in 2007 and 2008. Blue Mound State Park offers spectacular views of the dolomite and chert outcroppings and challenges cyclist&apos;s bike handling skills. Uplands Loop trail is a connector trail which provides about 8 total miles of bike trail. The Loop is generally a medium effort trail that is long, winding and grassy with variable grades through open fields, deep brush and woods. The Most scenic views are from the top of the East Bluff Trail on the south end. This free park is located just five minutes from downtown Madison in Fitchburg, WI. Quarry Ridge features three miles of unique trails. This park is popular among cyclo-cross riders and is ideal if you&apos;re interested in getting into mountain biking and are new to the sport. It is located in Verona, just 15 minutes from Madison. CamRock is 25 minutes from Madison, located between Rockdale and Cambridge along the Koshkonong Creek. These six miles of trail feature some of the most technical singletrack in the area. *Permits are required at CamRock County Park and Badger Prairie County Park and can be purchased at the parks or online. This asphalt trail connects with the Military Ridge State Trail and with Madison&apos;s Southwest Path, and is part of Badger State Trail that eventually will go to the Illinois border. Nine miles go through the scenic Capital Springs State Recreation Area. There is a $4 fee for biking the trail, taken by an honor system at a station at the end of the trail. This 40-mile packed dirt trail connects Madison to Dodgeville by way of the communities of Ridgeway, Barneveld, Blue Mounds, Mount Horeb, Riley, Klevenville, and Verona. Stretching for 52 miles through farmlands and glacial topography, this trail travels through ten small towns from Cottage Grove to Waukesha. The trail is on an abandoned rail corridor, except for a 1.5-mile section northeast of Jefferson, between State Highway 26 and County Highway Y, which uses public roads as the trail route. The smooth surface of the trail is crushed packed limestone until 13 miles from Waukesha where it becomes asphalt. This is a 24-mile recreation trail surfaced with limestone suitable for bicycling, walking and snowmobiling. A one-mile stretch in New Glarus is blacktopped and suitable for in-line skating. Named after the state animal, this 40-mile trail goes from Madison to the Illinois State line, and connects to the Capital City, Military Ridge, and Sugar River state trails. It also connects to the Madison bikeway system, Capital Springs and New Glarus Woods state parks, Albany State Wildlife Area, Ice Age National Scenic Trail, 13 communities in southern Wisconsin and northern Illinois, and numerous local parks. A National Scenic Trail located entirely within Wisconsin from Interstate State Park on the Minnesota border to Potawatomi State Park on Lake Michigan, the Ice Age Trail winds for more than 1,000 miles, following the edge of the last continental glacier in Wisconsin. Located about an hour north of Madison, this area provides more than 29 miles of hiking trails that vary in skill level. There is a one-mile interpretive nature trail and 1.5 miles of trail that are accessible for people with disabilities. Experience the wonder of nature on the trails at Holy Wisdom Monastery by exploring four miles of nature trails that are perfect for a brisk workout or contemplative walk. Dane County offers numerous hiking trails throughout the parks systems. View park maps at the Dane County Parks website.